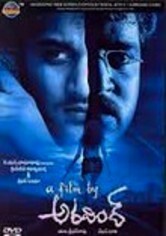 In this film about a film, art imitates life when childhood pals director Aravind (Rajiv Kanakala) and actor Rishi (Rishi) embark on their third movie together. In the script they've chosen, two friends' lives are transformed when they meet a mysterious woman -- but the story ends there, thanks to an ink spill covering the pages. When the friends set out to complete the script, they, too, encounter a strange woman -- and things soon get scary.